Members in the Canadian Leaders at Sea program participated in shipboard activities aboard HMCS St. John’s in recognition of International Women’s Day on March 7. Cdr Nancy Setchell (front and centre), Commanding Officer of HMCS Charlottetown, gave a presentation during the program. Members of the ship’s company give CLaS participants a training session on how to handle and fire a 9mm Sig Sauer handgun as well as the 5.56mm C8 service rifle. March 8 marked International Women’s Day, and it was on this day that the Royal Canadian Navy (RCN)’s Canadian Leaders at Sea (CLaS) program hosted 20 distinguished and accomplished women aboard HMCS St. John’s for an overnight sail. For many, myself included, this trip was a once in a lifetime opportunity. Though many of us live in Halifax, it is a rare occurrence to visit HMC Dockyard, let alone go on board an active frigate in the Atlantic fleet. 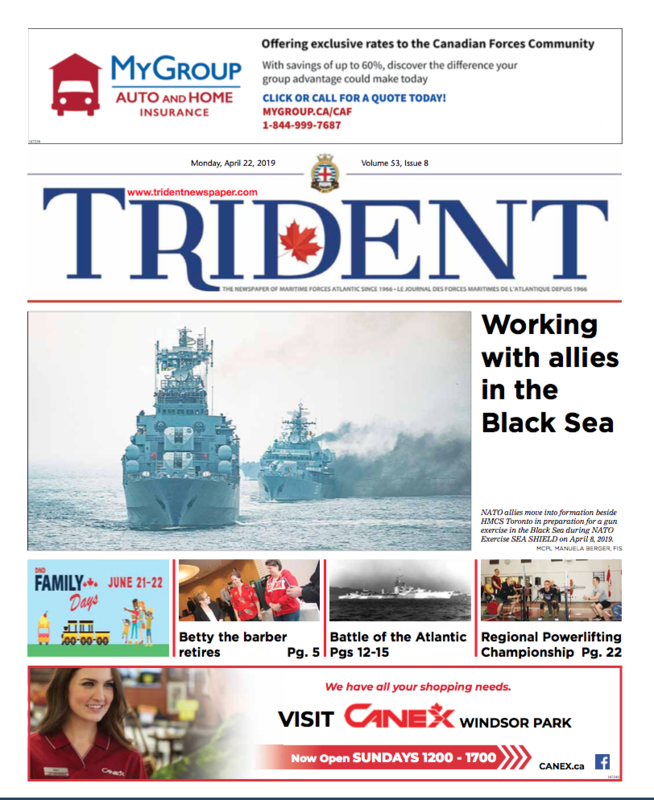 Though I used to be in Sea Cadets, the day-to-day duties of the Royal Canadian Navy still remained a mystery. I was very unfamiliar with the duties each sailor was required to do. To begin the day, we gathered in St. John’s hangar for a safety briefing by the Commanding Officer, Cdr Peter Sproule. Safety is always important, especially on a warship. Maneuvering yourself and others around this massive frigate can be very challenging. We then set out to my favourite part of the ship. The bridge watch tower. The second you open the door, you can feel the high paced environment, the expertise and the passion. Since we were preparing to leave the harbour, sailors were at their positions, ready to go. The CLaS members, the media and I were able to fit in this confined space along with the crew. We stood and watched intently as the bridge crew prepared to move the vessel. It was so interesting to see how every member played a key role in setting sail. Sailors were positioned on either side of the bridge to notify the crew of any obstructions so we could leave the harbour safely. The departure went smoothly and we were soon out on the open water preparing for the next exercise. “Man overboard!” someone from the starboard side yelled. A training mannequin named Oscar fell into the deep blue waters below. Immediately the ship went into emergency mode; I went outside to get a front row seat. Everything was happening so fast, they threw smoke markers in the water to get a general vicinity as to where Oscar could be. The ship then did the sharpest turn I have ever experienced in order to reach the man in distress. Looking down the starboard side, a group of sailors was lowering a zodiac inflatable boat into the water, as they had a visual on Oscar. Once the ship steadied, CLaS members came out to see the rescue mission up close. The sailors in the zodiac battled the cold waves while attempting the recovery. Their efforts paid off and the rescue mission was successful. This exercise was the first of many action-filled events the CLaS members participated in throughout the day. The group participated in a firefighting demonstration that had them dress up in protective gear for a walk through a smoke filled hallway to simulate fighting a fire on board. Everyone’s favourite activity appeared to be the firearms demonstration. 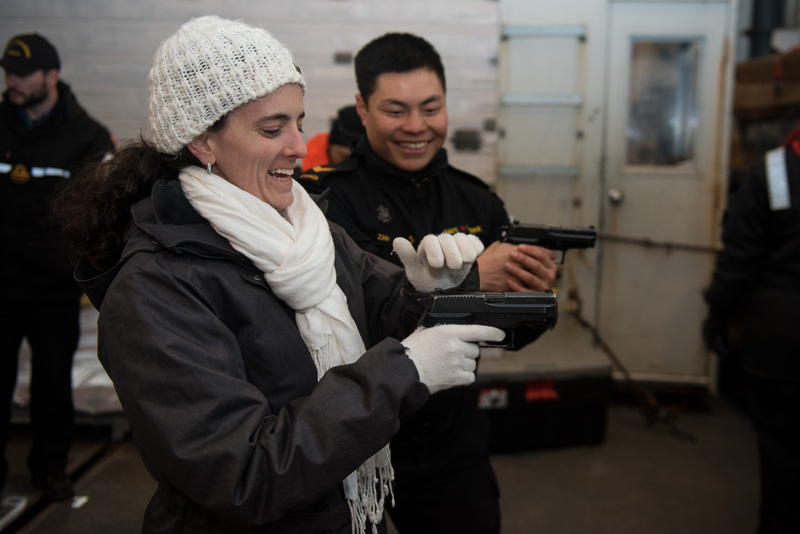 Members of the ship’s company gave a training session on how to handle and fire a 9mm Sig Sauer handgun as well as the 5.56mm C8 service rifle. All the participants were having a great time on the deck hitting the targets on the range. Many showed excitement and interest as they went through all the organized activities, and no one was afraid to ask questions. 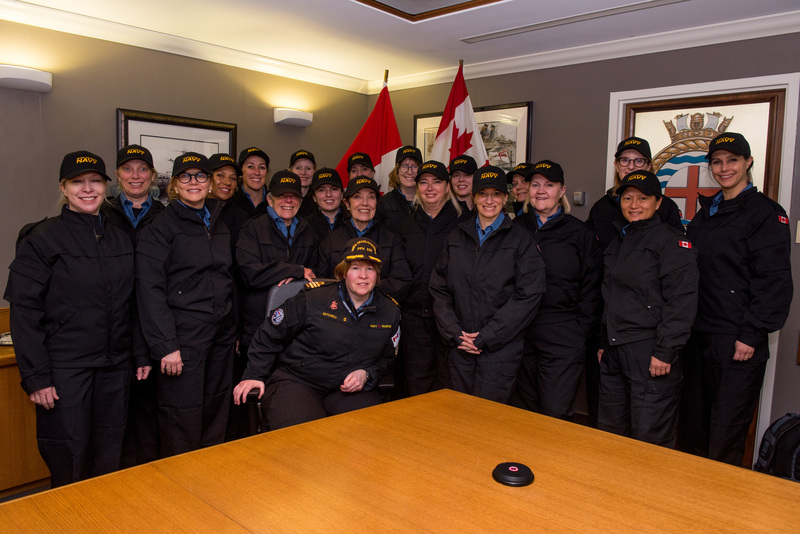 I felt this International Women`s Day trip was a perfect way to celebrate the ability and importance of women in all fields, especially those in the Royal Canadian Navy. As citizens of the general public, we rarely get a glimpse into the everyday life of a sailor. This program, and this event in particular, gave me and many others what we were hoping to see. Claire M. C. Kennedy (Managing Partner Clients & Industries, Bennett Jones LLP), a CLaS alumni (CLaSmate) of the Arctic CLaS program to Nuuk, Greenland aboard HMCS Charlottetown, during Op NANOOK 18, was asked to co-lead this year’s Women Canadian Leaders at Sea (WCLaS) program, a special edition in honour of International Women’s Day (IWD). 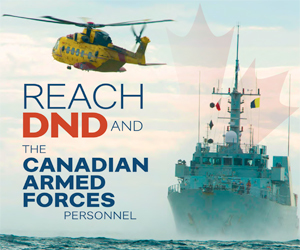 She also noted that Canada has three coastlines and acknowledged that civilians can sometimes overlook the importance of a Canadian presence at sea.